Will a UK welfare reform ease the UK’s EU negotiation? Emmanuel Mourlon-Druol, Lord Kelvin Adam Smith Fellow at the University of Glasgow’s Adam Smith Business School, examines the contentious EU freedom of movement rules, how they impact on the British welfare state, and UK government plans for reform. This post was first published by Bruegel. In a speech on 22 June 2015, UK Prime Minister David Cameron pointed at a number of possible changes that could be made to the UK’s tax credit system. The UK’s tax credit system is an arrangement whereby some taxpayers (families and individuals on low income) can deduct a certain amount of money from the tax they owe to the state (although you do not have to actually pay any tax to receive the tax credit: the name is misleading). The Labour government introduced tax credits in the 1990s. Why is the UK government suddenly thinking of reforming this system? The first immediate reason is the UK government’s official aim of cutting public spending. In an article in the Sunday Times on 21 June 2015, Chancellor of the Exchequer George Osborne and Secretary of State for Work and Pensions Iain Duncan Smith outlined a plan to reduce welfare spending by £12 billion a year. 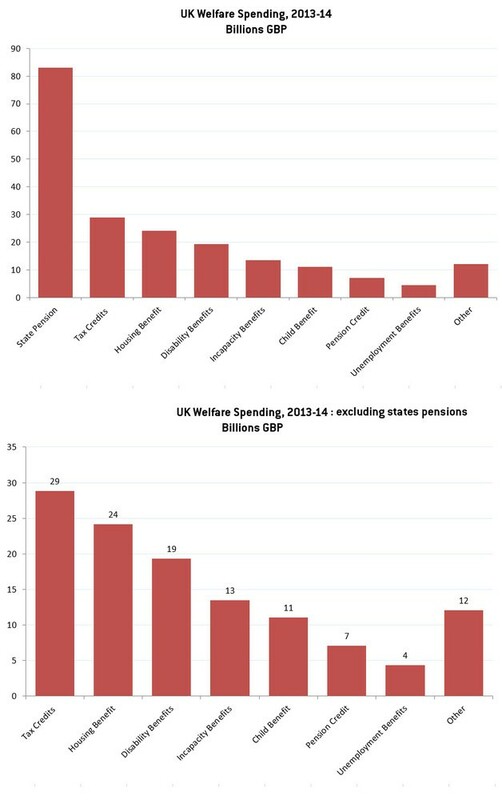 A quick look at UK welfare spending shows that tax credits (most importantly Child Tax Credit and Working Tax Credit) are an obvious area for attention, since cuts to state pensions have been ruled out. Incidentally, tax credits are regularly the subject of criticism, especially from the Conservative Party since the system was introduced under a Labour government. What David Cameron does not say explicitly is what would happen to the tax credits in their present form. The media clearly expects an attack on the current system, but specifics are lacking: The Guardian reported an ‘assault’ on tax credits; the BBC pointed at Cameron’s ambition to “end welfare merry-go-round.” The UK prime minister is clearly signalling profound changes to the tax credit system, but it is unclear how far he is ready to go in reforming it or perhaps more radically removing it altogether. But this reform could also have important implications for the UK’s EU renegotiation and impending referendum – and this could be the second motivation for reform. The ability of non-UK citizens to access tax credits that top up low wages was therefore most clearly spelled out. In the event of a profound reform of the UK’s tax credit system – in particular if the UK government decides to completely dispose of the tax credit principle – this would de facto remove the most contentious demand on the EU negotiation table. In November 2014 and again in January this year, German chancellor Angela Merkel for instance most clearly voiced her opposition to any change to the current rules on the freedom of movement, even at the expense of an eventual Brexit. But if people living in the UK, regardless of their citizenship, were no longer in principle to claim tax credits, why would the UK government ask for a change in the EU freedom of movement’s rules? The list of the UK’s negotiations demands would be easier to deal with, if very vague. In that sense, side-stepping the free movement issue via tax credit reform would bring today’s negotiation much closer to that in 1975, the year of the UK’s previous EU membership referendum (analysed in a recent Bruegel Policy Contribution). In 1975, British Prime Minister Harold Wilson formulated a list of demands – including changes to the common agricultural policy, retention by UK Parliament of some powers and fairer methods of financing the EU budget – that avoided going into the specifics. The UK renegotiations of 1975 brought mostly cosmetic changes, but the vagueness of the original demands allowed these cosmetic changes to be presented as successes during the referendum campaign. The situation could take a similar path today: removing the UK’s original request for EU Treaty changes on the freedom of movement would leave only a few vague items on the UK’s list of demands (see 2015 Conservative Party Manifesto): ‘reform the workings of the EU’, ‘reclaim power from Brussels’ and ‘safeguard British interests in the Single Market’. David Cameron’s plans to reform the UK’s tax credit system will therefore be an unexpected critical domestic component of the UK government’s EU negotiation stance. I would like to thank Stephen Gardner for his help in conceiving this blog and Thomas Walsh for compiling the chart’s data. Emmanuel Mourlon-Druol is Lord Kelvin Adam Smith Fellow at the University of Glasgow’s Adam Smith Business School and Visiting Professor at the Institute for European Studies of the Université Libre de Bruxelles.